Caffeine is what keeps us going all day long here at the RainyDayMagazine office. We occupy two floors of a duplex, but have three separate espresso machines; that should tell you a little bit about the pace around here. A GOOD cup of espresso, cappucino, or coffee is never more than just a few steps away. Recently, one of the machines started acting up. We thought…”Great! 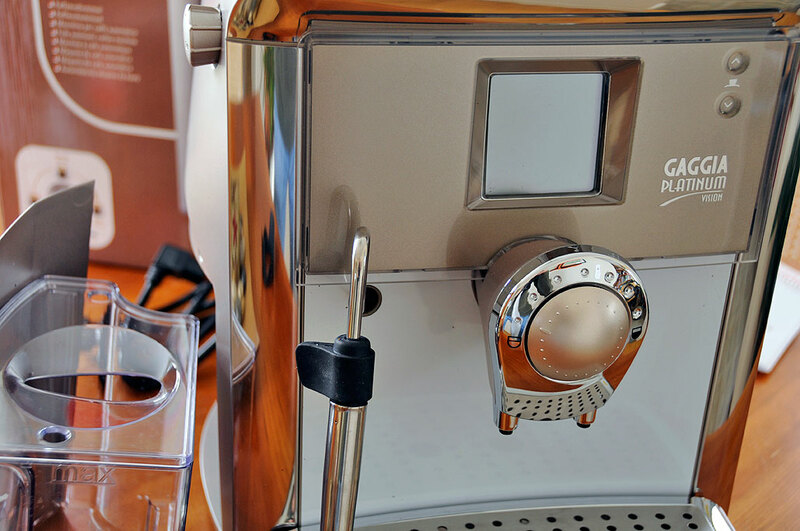 A DIY repair article for the interns.” Fortunately for them, a Gaggia Platinum Vision espresso machine showed up at the office. So, instead of a DIY article, the interns got to play with the new machine for a FirstLook report. 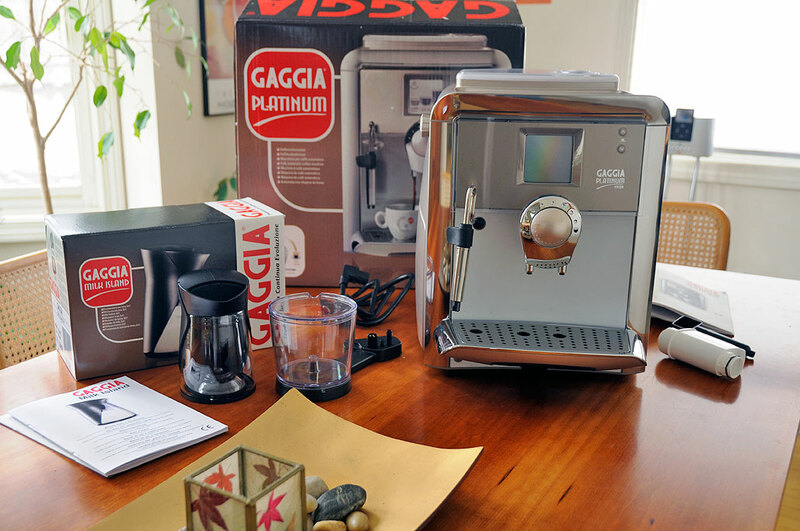 Gaggia S.p.A. is an Italian maker of coffee and espresso machines designed for both commercial and home use. Gaggia began in 1948, a decade after Achille Gaggia filed a patent (number 365726) on a machine which eventually evolved into the modern day espresso machine. Gaggia’s first home espresso machine, the Baby Gaggia, was created in 1977, specifically for home use. Even today, many still regard it as the perfect family coffee-maker. All of Gaggia’s espresso machines are still produced in the Robecco sul Naviglio factory in Milan. 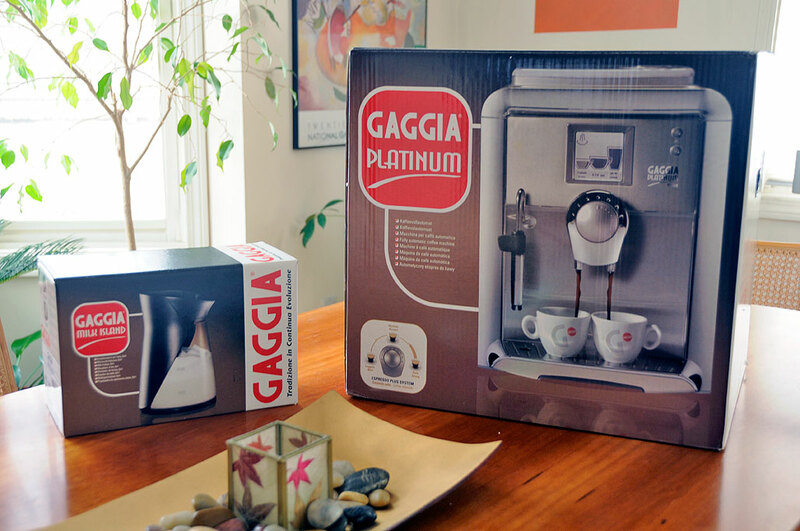 The Gaggia Platinum Vision is the top model of Gaggia’s domestic line. To complement the espresso maker, Gaggia offers a milk island accessory. The machine is sized to fit into any room or office. The body is made of ABS plastic and the front panel of stainless steel. In order to not clutter up the front panel, functions are selected via a touchscreen instead of physical buttons. Internal to the Platinum Vision is a stainless steel boiler, a water pump capable of generating pressure of 15 bar, and a ceramic burr grinder. A perfect espresso starts with using freshly ground beans. Burr grinders are better than blade grinders because they produce a more uniform grind. All high-end machines have integrated burr grinders, but the Gaggia Platinum Vision does them one better. Its integrated grinder uses ceramic burrs instead of the steel burrs. Ceramic grinders are superior in several ways. They are quieter in operation and will last much longer than their steel counterpart. In fact, the ceramic grinder will definitely outlast the operational life of the machine. However, the most important aspect of a ceramic grinder is that they produce the least amount of heat of all grinder types. This will ensure that none of the beans are scorched in the grinding process, which alters its flavor. On the left is the removable water reservoir with a 1.7L capacity. On the right is the pull out waste container. On top of the waste container is another panel which gives access to the internal mechanism of the machine. Judging by the looks of it, the entire assembly may be removed for cleaning purposes. This is a HUGE feature judging by the struggle we had with the Jura Z5 when we wanted to do a simple DIY lubrication maintenance. We will set up this machine and have a detail FirstUse report ready in time for the Summer iPad issue of RainyDayKitchen. Look for it in the Apple AppStore in July. If you are sold just by this FirstUse write-up and want your own now, this Gaggia Platinum Vision is available directly from Importika. Go check them out for all of your caffeination needs!